I have a confession. Want to hear it? Spare you? Geez, sorry…it was so harmless. Fine, moving forward. Asparagus could not be more delicious, fresh and affordable this time of year not to mention it’s impressive nourishment profile: it is full of antioxidants, fiber, folate and vitamins A, C, E and K. So let’s all agree to take advantage of it as much as we are able. Okay? Okay. This soup is a mystery to me. It is absolutely amazing how much flavor comes thru with such few ingredients. It is gorgeous to look at and even better to taste; it’s rich, silky and bright tasting and the crispy, chewy croutons on top are the perfect compliment. Insanely good paired with a grilled ham and cheese…mmm, pure comfort on a rainy day like today. I love the way asparagus makes my pee smell. Sorry. I had to. If you don’t like confessions this probably isn’t the best place for you to stop by. I’m catholic and full of guilt that I need to get off my chest. I feel so much better, thank you. Heat olive oil over medium high heat in a large soup pot or dutch oven. Add asparagus and onion and saute until asparagus is tender, about 10 minutes. Add garlic, thyme, salt and pepper and saute for 1 minute. Add chicken stock and bring to a boil. 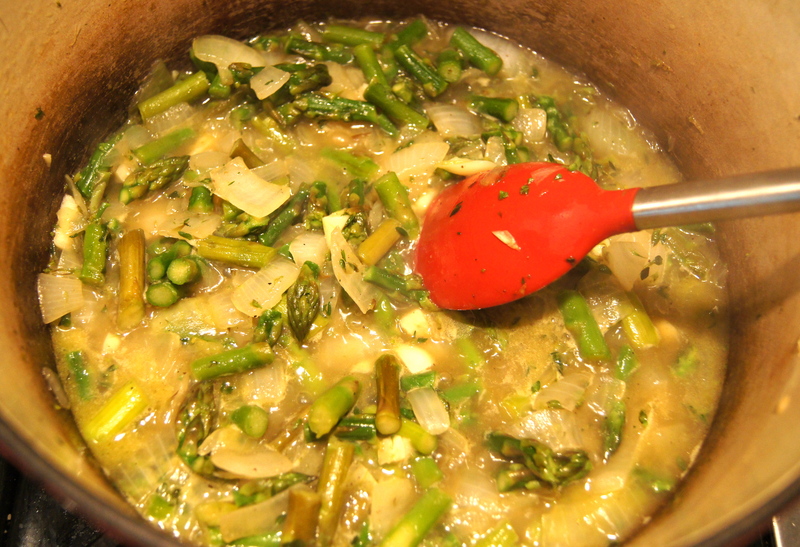 Turn heat down and simmer soup until asparagus is soft, 20 minutes. 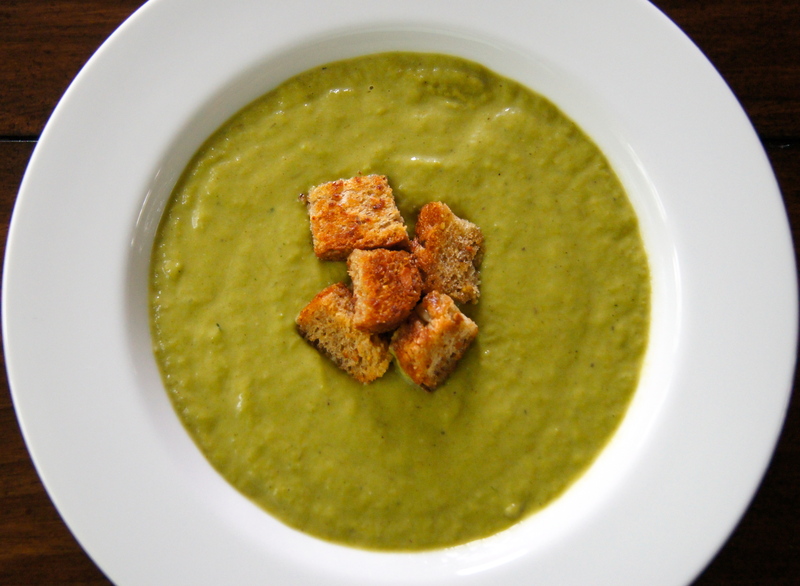 Transfer soup to a blender or food processor and puree until smooth, 2 minutes. Return puree to soup pot and place back on the stove over medium low heat. Add half and half until the soup has reached your desired thickness and cook until warmed through. 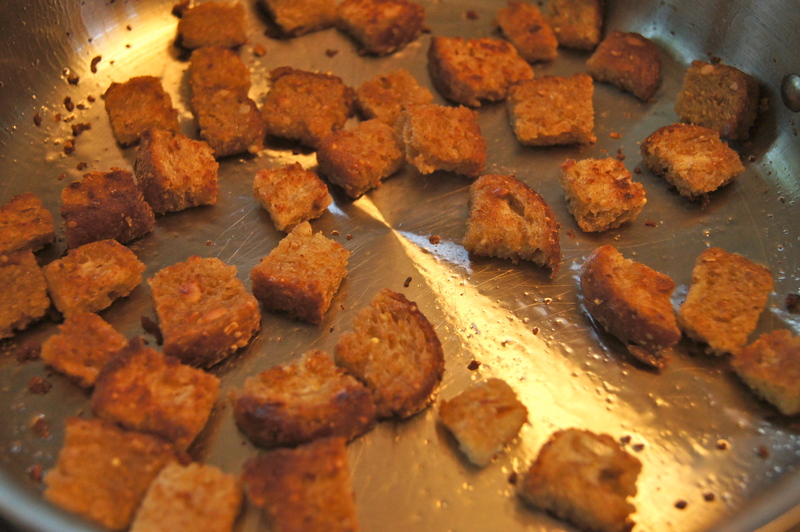 Top with Whole Grain Croutons. Serves 4. Note: these can easily be made gluten free by opting for gluten free bread. In a medium skillet heat olive oil over medium heat. Add bread and stir to coat with the olive oil. Toast, stirring occasionally, until bread is golden in color and begins to crisp up, 7-10 minutes. If the bread seems too dry and is not toasting well add another drizzle of olive oil to coat the bread.